MADISON, N.J. – Two goalline stands in the fourth quarter and seven receptions for a career-high 145 yards and two touchdowns from senior Nick Costello (Havertown, Pa./Haverford) helped lift the Lycoming College football team to a 27-21 win over the Middle Atlantic Conference’s last undefeated team, FDU-Florham, on Saturday, Sept. 22, at Shields Field. 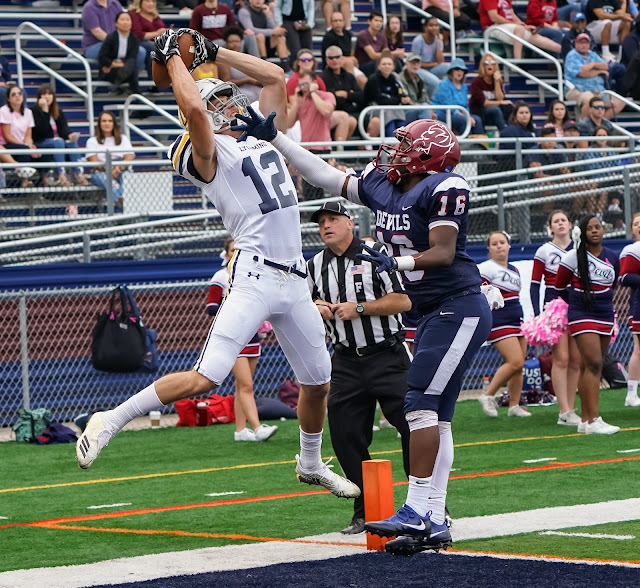 FDU-Florham (3-1 overall, 1-1 MAC) put together two prolonged drives in the fourth quarter with the score 27-21. The first was a 12-play, 62-yard drive that stalled at the three-yard line with 5:23 left. The Devils got a first down inside the 10, but a trio of rushes netted just four yards and a pass breakup by freshman Nasir Bowen (Elkins Park, Pa./Archbishop Wood) ended the drive. The Warriors (3-1 overall, 2-0 MAC) gained nine yards on three rushes in response, but were forced to punt from their own 12-yard line, giving FDU-Florham the ball at the FDU 46 with 3:02 left. The Devils again drove to the three-yard line, this time with 26 seconds left, but an illegal formation penalty was followed by two incomplete passes, helping Lycoming hand on for the win. With the score tied at 14, the Warriors posted a 16-play, 86-yard drive on their first possession of the third quarter. Sophomore Len Wyda (Berwick, Pa./Berwick Area) spearheaded the drive, rushing eight times and gaining two first downs. With the ball at the 35 on 3-and-11, freshman Elijah Shemory (Jersey Shore, Pa./Jersey Shore Area) found sophomore Dezmen Johnson (Browns Mills, N.J./Pemberton Township) for a 12-yard pass. Two plays later, Shemory found a leaping Costello for a 16-yard score to make it 21-14. On FDU’s next play, junior Jeff Coplin (Philadelphia, Pa./Central) picked off his second pass of the year near midfield. 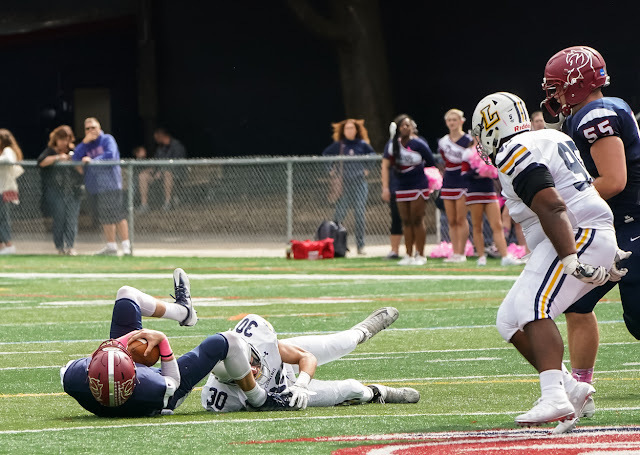 Freshman Justin Joseph (Exeter, Pa./Wyoming Area) kickstarted the ensuing Lycoming drive with a 32-yard rush, getting the ball to the 12 and with the first play of the fourth quarter, Shemory found Costello for an 11-yard score to make it 27-14. FDU got within a score just less than two minutes later with a trick play, as Josh Rainey found Damarquis Price for a 58-yard score, setting up the end of game dramatics. Shemory finished 11-of-19 for 242 yards, tossing three touchdowns while being intercepted once. Costello was his favorite target, as he notched a career-best 145 yards on seven catches. Johnson had two catches for 31 yards. Wyda led the rushers with 22 carries for 63 yards and Joseph had six carries for 40 yards. Junior Sam Pawlikowski (West Creek, N.J./Seneca) had seven tackles and a sack and senior Joe Pinzka (Perkasie, Pa./Lansdale Catholic) had seven stops and an interception. Coplin and sophomore Gianni Bryant-Lopez (Delran, N.J./Delran) also had interceptions. In the first quarter, the Warriors got on the scoreboard with their second drive of the game, with Shemory lifted a long pass for junior Christoff Minott (Upper Darby, Pa./Upper Darby), who scampered into the end zone for a 64-yard score. FDU-Florham responded, tying it in the first quarter with a 15-yard pass from Jagger Green to Mike Panzarino. The Warriors took the lead back in the second quarter with a 10-play, 58-yard drive that ate 5:30 off the clock, as Minott tossed a pass to Johnson, who sidestepped a defender and found the pylon for a score. The Devils responded, as Josh Rainey took a pitch and went 80-yards for a score to tie it. Lycoming didn’t wait long to respond, with Costello an over-the-shoulder catch for a 47-yard catch to get the ball into the red zone on the first play after the kickoff, but the Devils were able to make a stop and despite three more pass plays for more than 20 yards in the quarter, neither team could take the lead into the locker room. Although the Devils rushed for just 54 yards, Jagger Green finished 38-of-52 for 377 yards and two touchdowns. Mike Panzarino had 15 catches for 164 yards and a touchdown. Isaiah Turner finished with 16 tackles, four for loss and three sacks to lead the Devils defense. The Warriors get back on the field on Saturday, Sept. 29, when they face King’s College at 1 p.m. at David Person Field for another MAC game. Panzarino 2-4; Jagger Green 3-2. Oquendo 0-0-0-0. 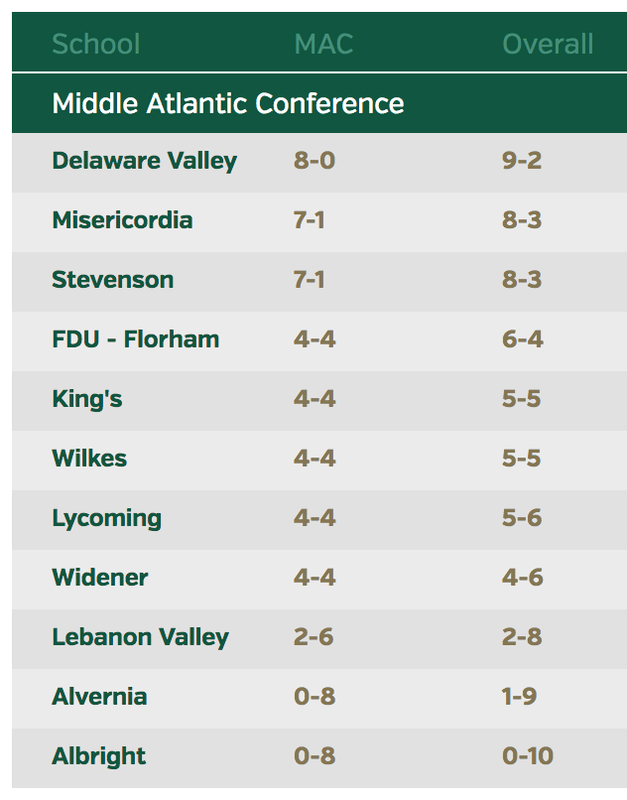 FDU-Florham-Jagger Green 38-52-3-377; Josh Rainey 1-1-0-58. K.Camillo 2-4; Josh Rainey 1-116. Matt. Dougherty 0-1; Diony Dilone 0-1; Michael Gillen 0-1; Shyheim Outland 0-1. Robert Planter 0-1; Michael Gillen 0-1. 46-Justin Joseph, 47-Trey Borger, 51-Taylor Kim, 55-Trent Riggs, 58-Ethan Newton, 87-Kevin Krawczyk, 91-Duane Boone. 93-Justin Munoz, 95-Matt Wible, 97-Alex Harley, 99-Brian Ireland.